Mr. Armani,however, prefers to dress in jeans, sneakers and a black t-shirt. All perfectly clean, laundered and pressed. A lot of designers don’t seem to actually wear the clothes that they design for us. But they have developed public personae that they seem to think suit themselves. Finding your look is essential to developing your elegant image. Are you more continental? (J.P.Tod’s founder Diego della Valle, Gianni Agnelli.) More American? (Older Fred Astaire, JFK, 1950’s Cary Grant, Gary Cooper, Jimmy Stewart.) More British? (HRH Prince Charles, Hugh Laurie’s Wooster, Sir Paul Smith.) Or somewhere in between? (Young Fred Astaire, Ralph Lauren.) Casual? Buttoned up? Formal? Eccentric? Old Fashioned? Timeless? Unsure? How do you decide? Ask yourself this question: what item of clothing do I value the most? Build your wardrobe around that item Cultivate your appearance. Here’s the part that may be most difficult. When you find what works for you, stick with it. Refine it. Own it. If navy blue is the best colour for you, vary the stylistic details, but stick with navy blue. If you feel most elegant in a plain white shirt, have them made to fit you perfectly. And that means staying away from trends, seasonal forecasts … fashion, to a point. For years it was my blue blazer. Then my dinner jacket. Then a perfect grey flannel suit (DB). Then a sportcoat that could go with anything. Cashmere turtlenecks entered the fray one winter. Then white linen trousers. Then perfectly cut grey flannel trousers. Sometimes with Hollywood waists. Then the archetypal blue suit. A perfect polo coat and the right leather jacket were hunted down and bagged. Don’t get me started on brown suede shoes. My dueling sartorial personalities are joined by their aesthetic counterparts in interior decor. My tastes, like all tastes do, are evolving, thanks in large part to the wonderful design blog community. Where the scenery used to be a glamourous backdrop for the well-dressed actors, it is now a player. 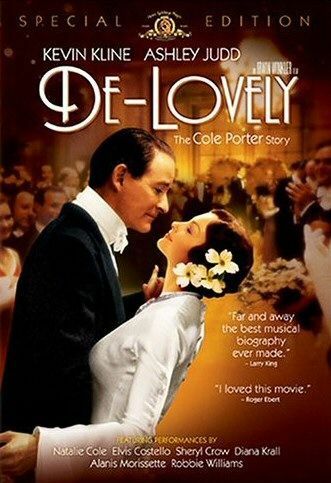 I recommend re-watching of “De-Lovely” for exactly that reason. That’s living, baby. It is a mix that attracts me. (Especially the mix of houses. New York. Venice. Paris. MA, USA, even.) But the mixture of (forgive me decor friends as I murder the period attributions) Louis XVI (?) French, Italian, Chinoiserie, Deco, etc. etc. etc. It is a glamourous grand tour of theatrical proportions as befitted les coleporteurs. Hand me a winning lottery ticket and sign me up. Finally the movie in its scripted dialogue sparked in me a desire to hear people speak that way again. Fortunately, I have the movies. Life seems to have gotten smaller. In particular, I urge you to listen to the scenes between Ms. Judd and Mr. Kline (and use the subtitles as I do.) When people used to use the word “love-making” this is the sort of stuff to which they referred. Sure he’s used to thinking in terms of lyrics (“Until you can say it better in words, Cole sings.” Says Gabe.) But shouldn’t speech be at least a little lyrical? Bring back the double-entendre. The bon mot. A lovely turn of phrase. And best yet, romance. This is, after all, a love story. “Night and Day” Cole Porter. This entry was posted in Cultivating and tagged Cole Porter, De-Lovely, movies. Bookmark the permalink. I also enjoyed the movie for the Murphys, costumes, and sets. It was such an elegant time. Style is a vexing question for me. Now that I am officially “in my 30’s”, it seems like it’s really time to buckle down a pick a look. It’s time to say goodbye to the wishy washy “let’s try this” of my 20’s. As someone who came of age during grunge, I think the fact that I was trying anything other than flannel was a sign of growth. I’m stuck somewhere between the 40’s and 60’s in terms of style icons. A great movie and one of my favorite sound tracks as well – the title track “DeLovely” is worth the $9.99 iTunes price alone. Speaking of designers, what I’d like to find is a designer who worked in older Italian tailoring…think Rome in the 50s and 60s. The old line men’s stores that Alan Flusser identified in his “Style and the Man” are now all closed, much to my disappointment. Whoops! Not all of my post appeared…My style icons shift between Jackie Kennedy, Audrey Hepburn, CZ Guest, and Princess Grace. Although, for the weekend, I love the Lily Pulitzer look. LuLou, choosing among the Pantheon is never easy; nor can you go wrong. There is always a happy intersection there, though. I suggest subscribing (or browsing on line) to “Q” Magazine. Brilliant resource. Oh, swoon. Cole Porter singing “You’re the Top” with the period lyrics is my personal favorite on that soundtrack. (though Joan Morris is my favorite interpreter of the classics but her albums didn’t make it to CDs, alas). When I was young I was into all the looks. I had my hippie clothes (suede flag vest with fringe to the knees, rice-dyed Indian skirts) and my minis and maxis and hand-painted shoes. They all went to the costume collection here at the state Historical Society. Now it’s all about classic shapes, solid colors and lots of black. For drama and personality, I wear shawls and scarves (lots of Laotian silk ikats, wool paisleys), Japanese haori jackets, and hats, hats, hats. I can’t count them all. Everything from my grandmother’s black velvet oversize beret from the early 20th century to a fedora to a floppy straw hat whose brim is so big two people could shelter under it during a rain storm. I also once carried home a big hat from San Francisco that had a seat on the plane to itself. My hat philosophy: don’t worry about how it looks or what people will say. It’s all about chutzpah. Recently, friends found our group among hundreds of folks sitting on the UW Memorial Union Terrace by looking for the gang where a woman was wearing a hat. Bingo, me! A thought provoking post. Style is such a personal quest. Some of my most favorite people in the world are those that do not take themselves “too seriously”- yet I admire a person who has a defined look for night and day. Most designers spend all their time obsessing over the next collection, that they do not want to spend time on themselves with trends, hence Givenchy, YSL come to mind, an elegant mind. Night and Day is one of my favorite songs of all time!! I loved the movie. Cole Porter was a genius! Karena, pure genius. I love that Cole Porter thought that Fred Astaire should have played him as they were similar types. But, as he put it, who would say no to being portrayed by Cary Grant?